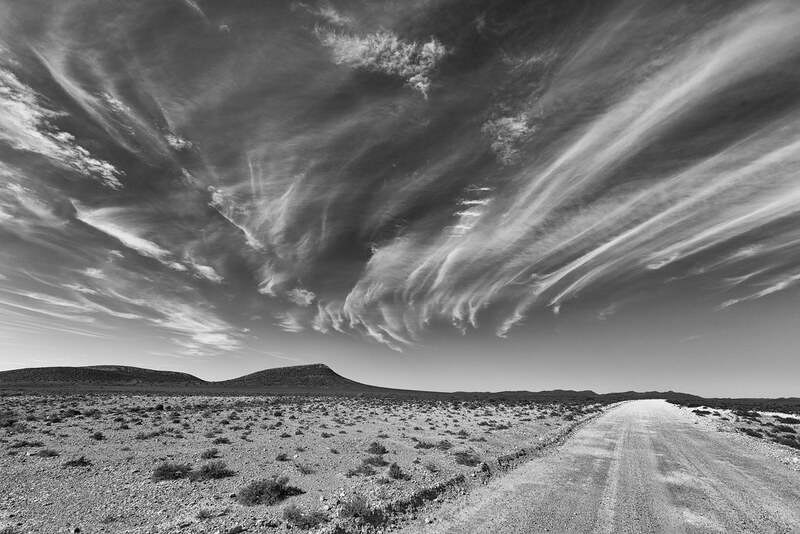 South Africa – Part 2: Into the Karoo – Ouestef? 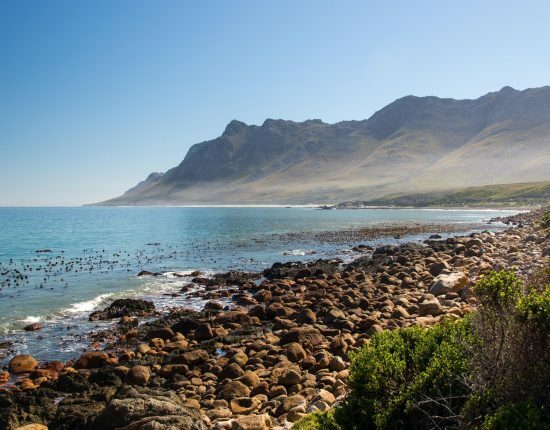 Next ArticleSouth Africa - Part 3: Cape Town and safaris! 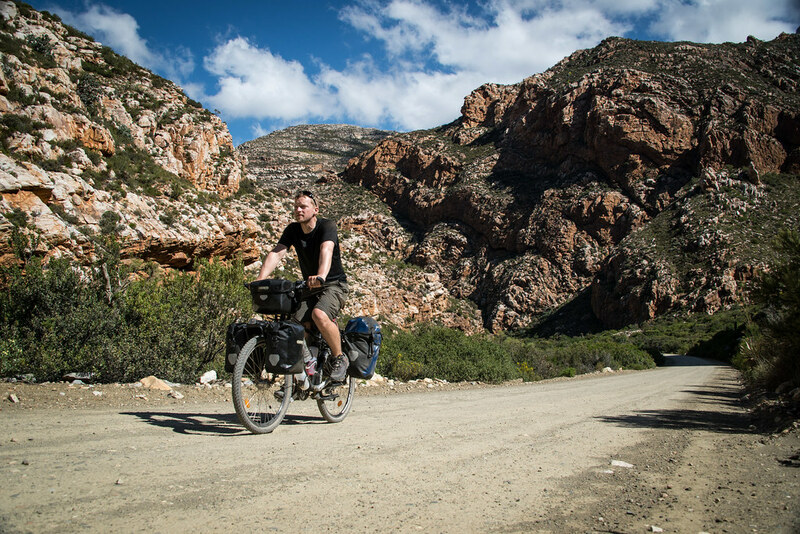 As I left the city of George and started the climb up the old Montagu Pass, I wondered how the second part of my bike trip would compare to the amazing seven days that I had just experienced along the beautiful Overberg and Garden Route coasts. 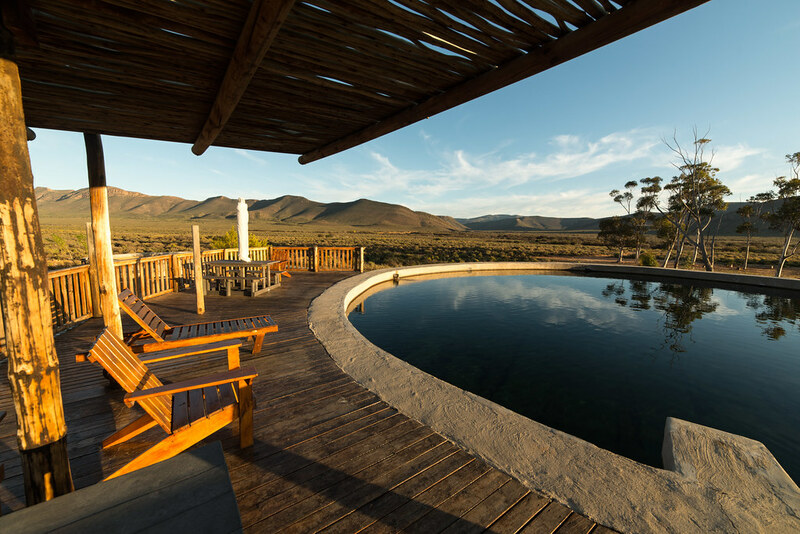 On the other side of the Outeniqua mountains lay the Karoo, a region of South Africa that many desert aficionados consider to be on par with places like the Outback in Australia or the Nebraska Sandhills in the United States. 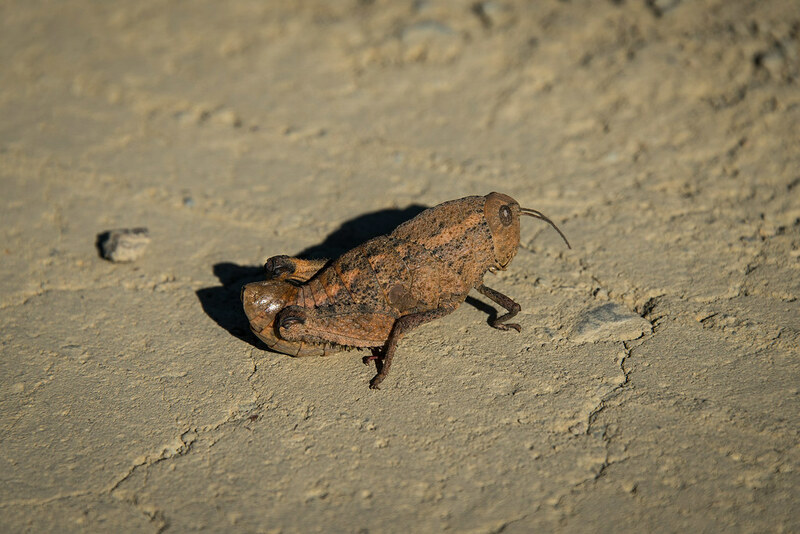 It is a place of arid landscapes, cloudless blue skies, secluded small towns, remote dirt roads and picturesque mountain passes. All the ingredients needed for another epic bike ride. 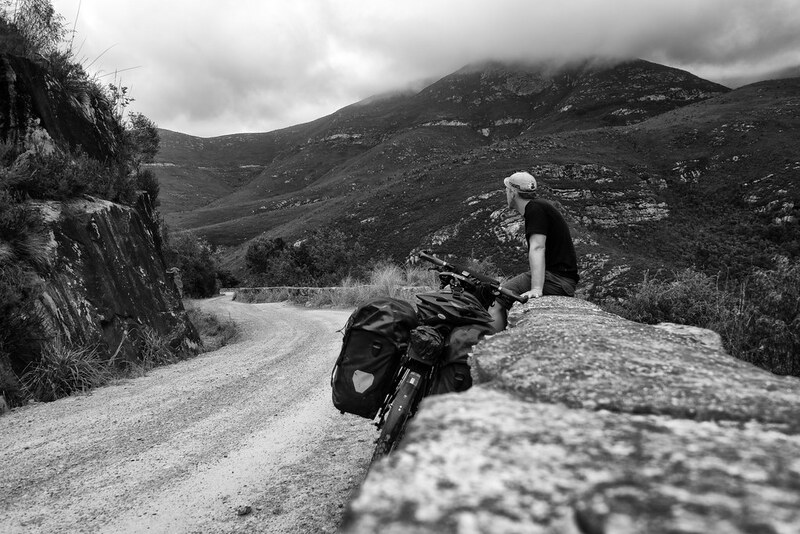 Having a break on my way up the Montagu Pass. 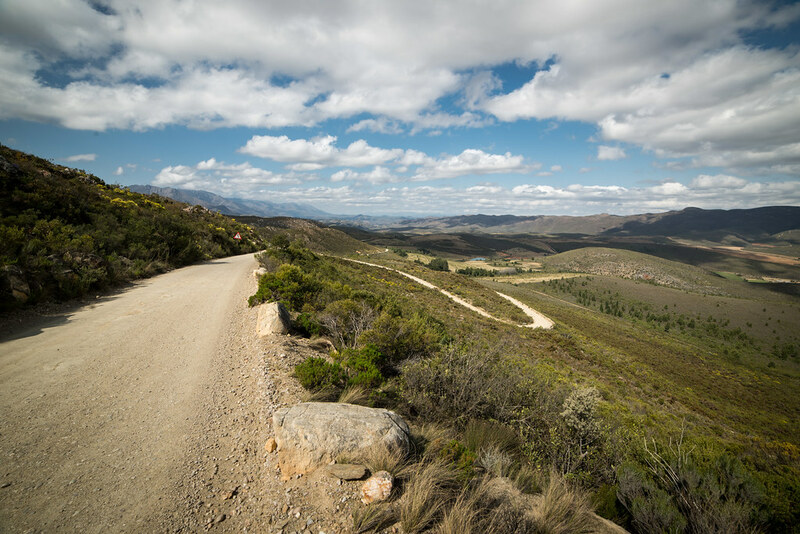 The old pass, which was built by convicts at the end of the 19th century to reduce the time needed to cross the Outeniqua mountains, was the first proper mountain road I took on the trip. 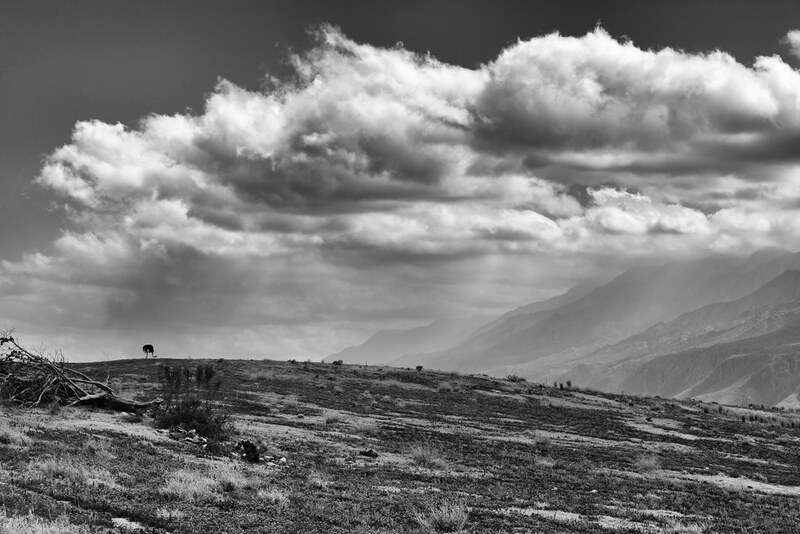 The remote dirt road was quiet and it offered spectacular views of the surrounding mountains, despite the low clouds that kept the higher peaks hidden. 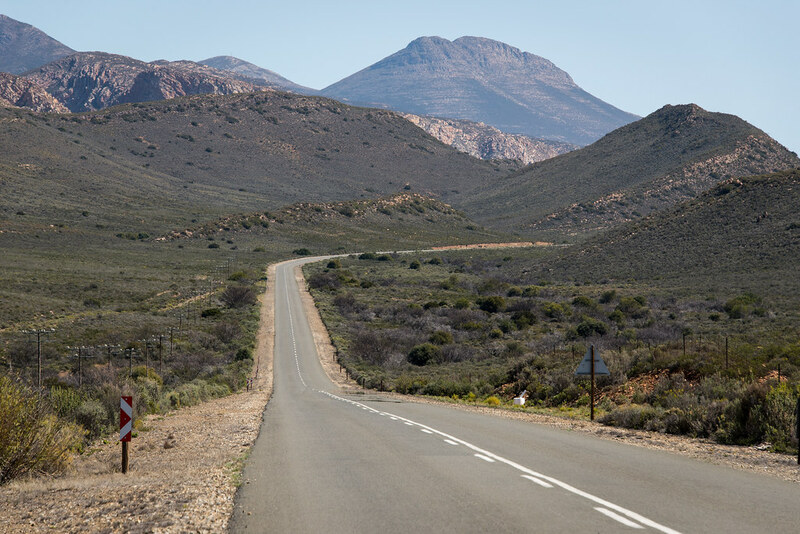 On the slopes of the mountain on my right, I could hear and see traffic on the Outeniqua Pass, which replaced the Montagu Pass in the 50’s as the main road to the Karoo. 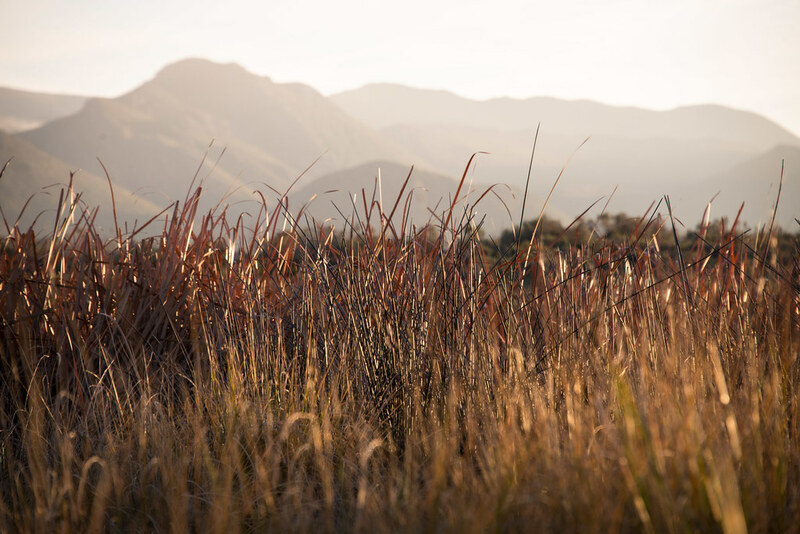 Once on the other side of the pass, the scenery changed quite dramatically, switching from lush and green forests to dry and dusty planes covered with fynbos . 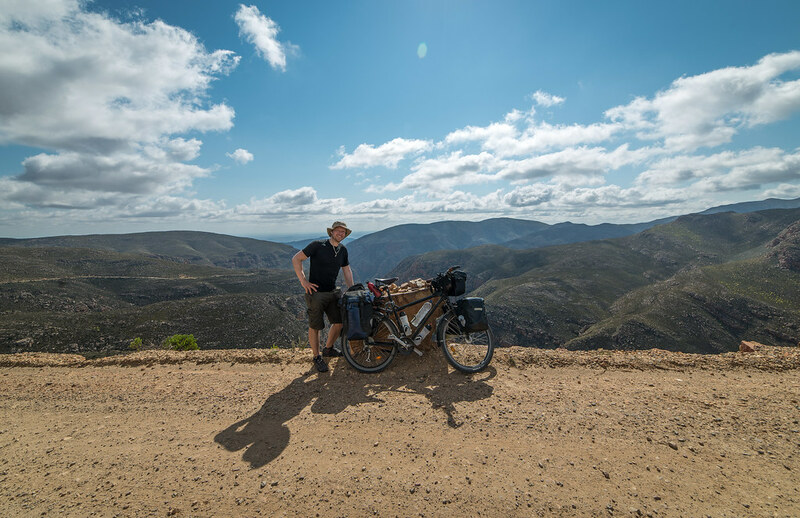 I had now entered the Little Karoo, a 300 km long and 50 km wide valley between the Swartberg mountains to the north and the Langeberg-Outeniqua range to the south. It was also my first encounter with ostriches, which are farmed extensively in the area, for their skin, meat, feathers and eggs. 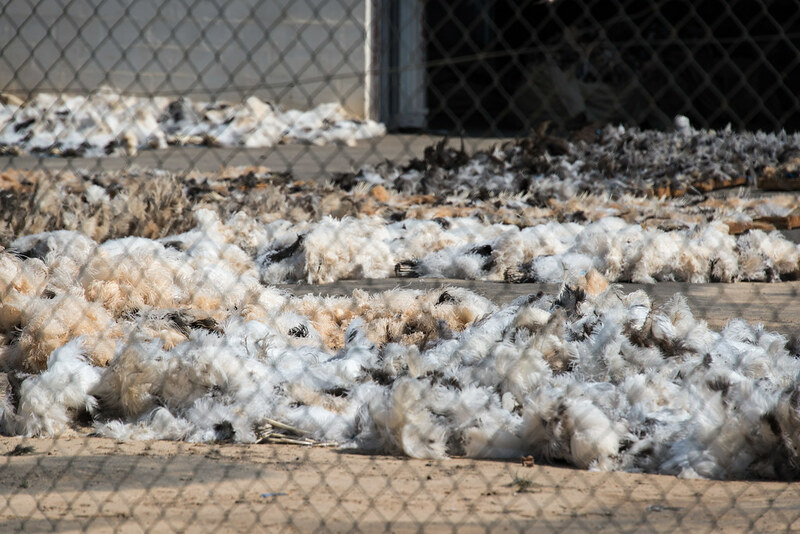 Ostrich feathers spread out on the ground in the back of an ostrich farm. 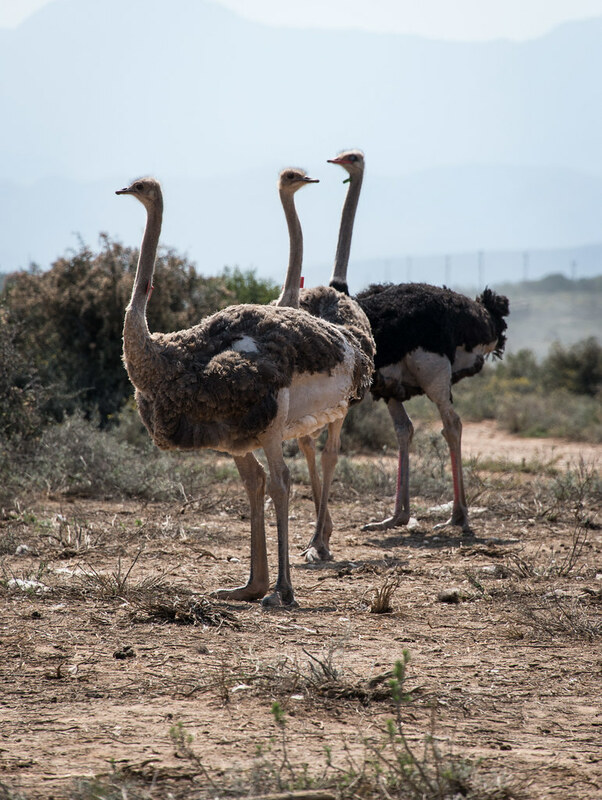 Farmers started to farm with ostriches in the 19th century following a massive drought, when they realised that the tall birds didn’t need grazing and could feed off certain grains found in this naturally dry region. 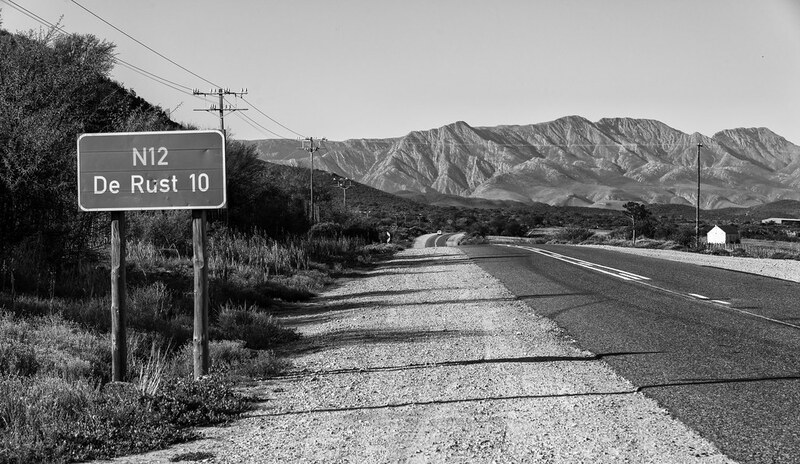 Last 10 km before arriving in De Rust, my goal for that first day in the Klein Karoo. Every town I cycled through, no matter how small, had a shanty town somewhere on the periphery. Although most of the settlements I saw had shelters made out of scraps plywood or corrugated metal, some like this one outside De Rust would have little houses built with bricks or concrete. Crossing the Swartberg Mountains (for the first time) through the Meiringspoort, a beautiful gorge cut by the Groot River. 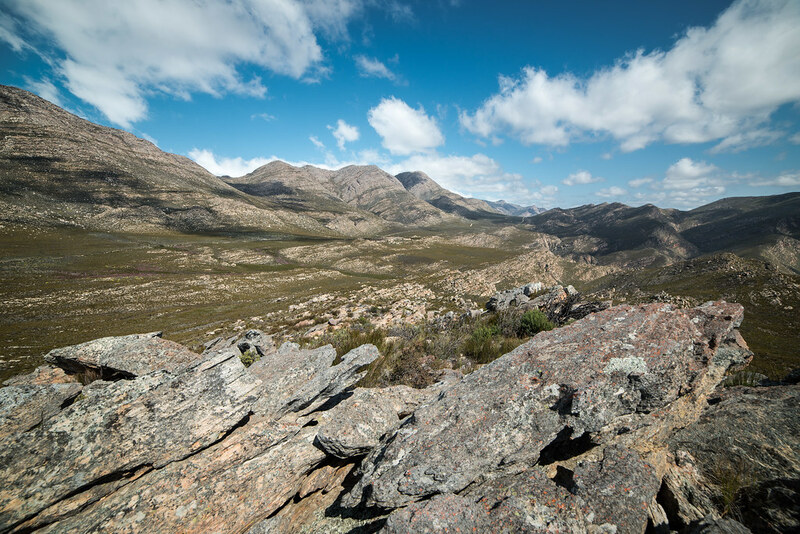 The Swartberg Mountain Range separates the Klein Karoo from the Great one in the north. Road 407 between Klaarstroom and Prince Albert. In Klaarstroom I stopped for lunch outside a building that served as a grocery store, petrol station and post office. 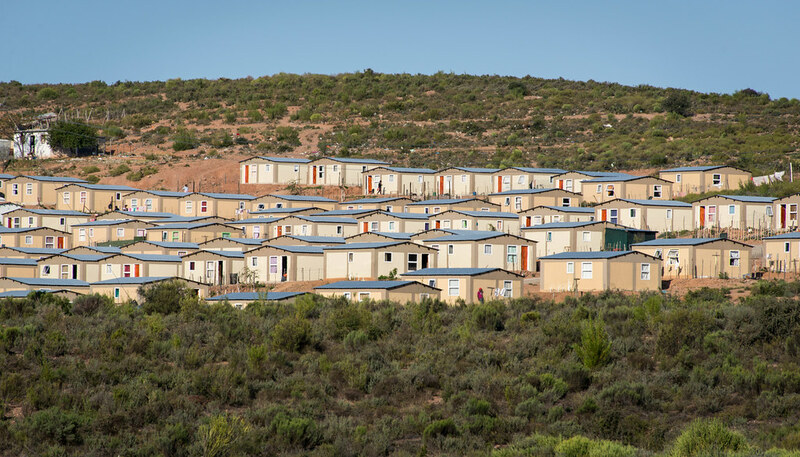 I went in and had a friendly chat with the Afrikaans lady running the business, mainly about the ups and downs of living in a secluded little town like this one. After showing me some pictures of her family, she told me that her daughter was one of the best pilot instructors in the country but had to move to Dubai after having been unable to find any work in South Africa for a whole year. “White people can’t find any jobs in this country nowadays, the government wants to make up for what happened during the apartheid”. I noticed the resentment in her voice as she said this, but not knowing enough about the political and economical situation in the country I didn’t push the discussion any further… This wasn’t the first time I’d heard a white South African say this though and it confirmed my general impression that South Africa will need many more years before all these issues between black and white people are resolved. 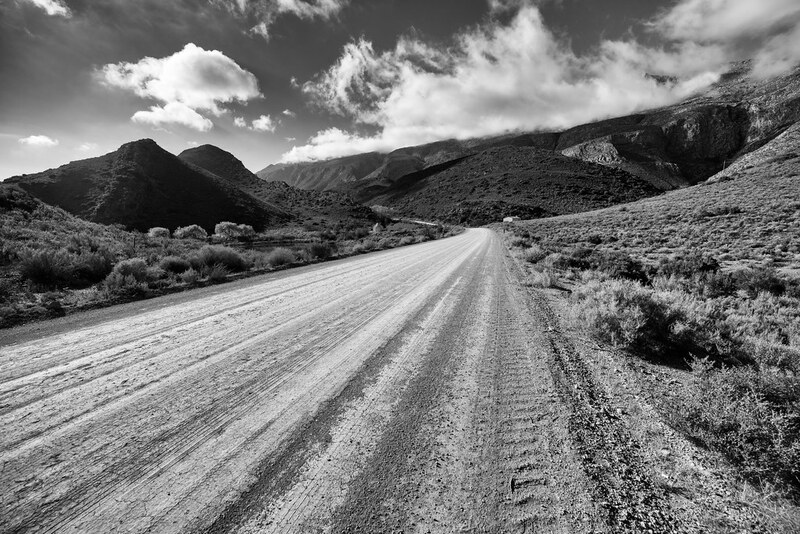 Crossing the Swartberg Mountains (for the second time) and looking back at the winding road taking me to the top of the Swartberg Pass. 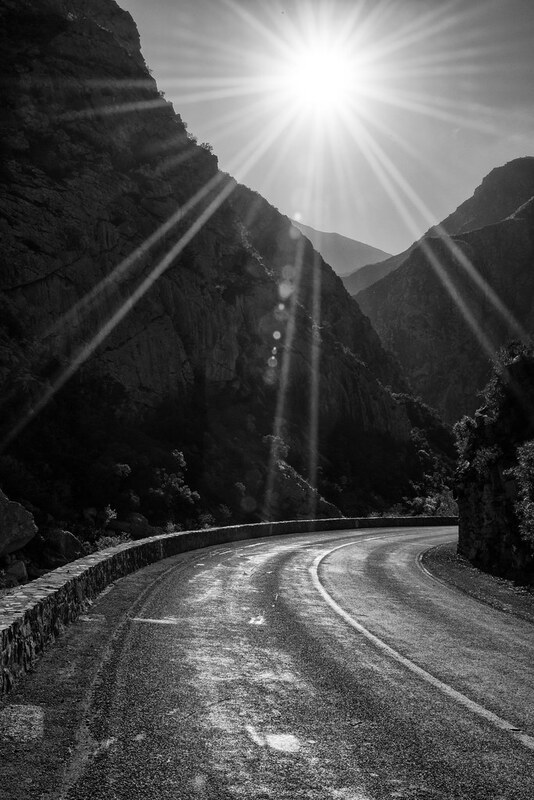 The spectacular road, which was also built in the 19th century by convicts (who else? 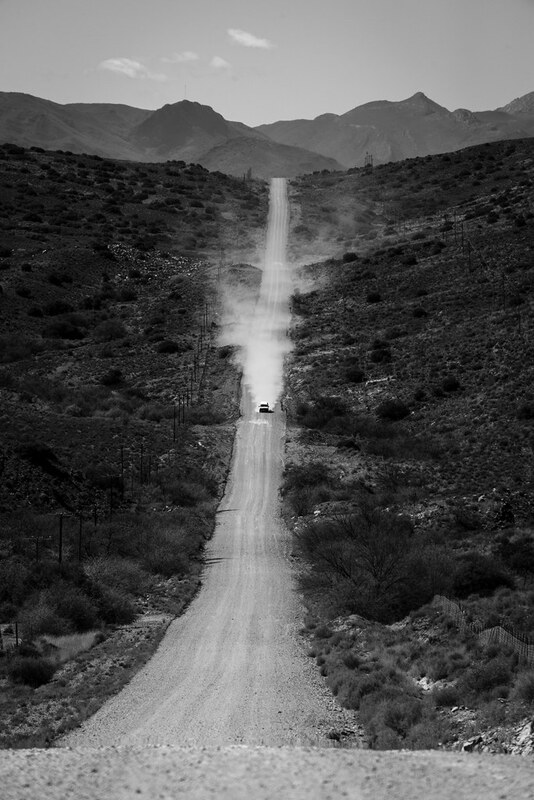 ), reaches an altitude of 1583m above sea level before plunging back down into the Klein Karoo. Upon arrival in Prince Albert the day before (a picturesque little town where I ate the best lamb shank of my whole life) I was greeted at the campsite by Jono and Gerda, a South African couple exploring the region in their minivan. Soon Jono was pressing a cold beer in my hand and telling me that I deserved it. “I know how you feel, I spent a whole year cycling from South Africa to Mount Kilimanjaro and back!”. The next day I was having a break on my way up the pass when their minivan pulled up next to me. This time they offered me a cold bottle of coke… Such friendly people! 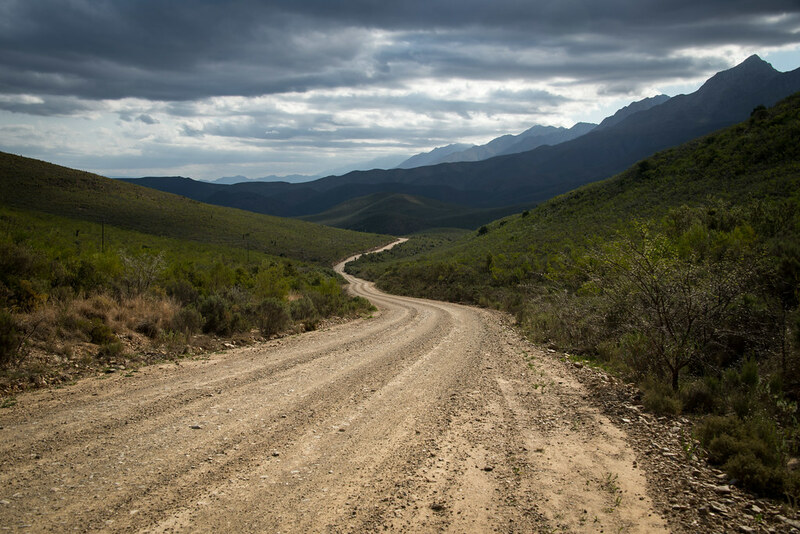 The gravel road to Gamkaskloof, a narrow and isolated valley stretching over 30 km within the Swartberg Mountain Range. Also know as “Die Hell”, it is supposed to look spectacular but unfortunately the road through it ends in a cul-de-sac (unless one is prepared to heave his/her bike up the side of a steep mountain, something mountain bikers quite often do), so I didn’t get the chance to explore it. 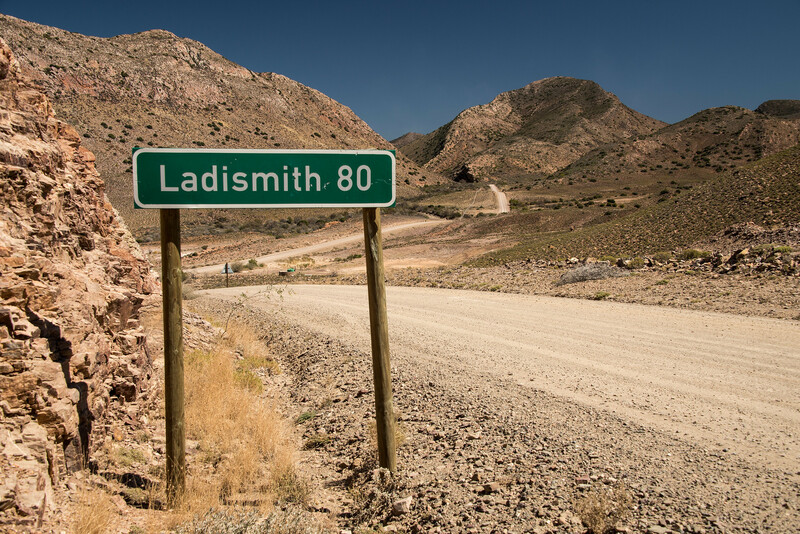 Back in the Klein Karoo, on the other side of the pass. 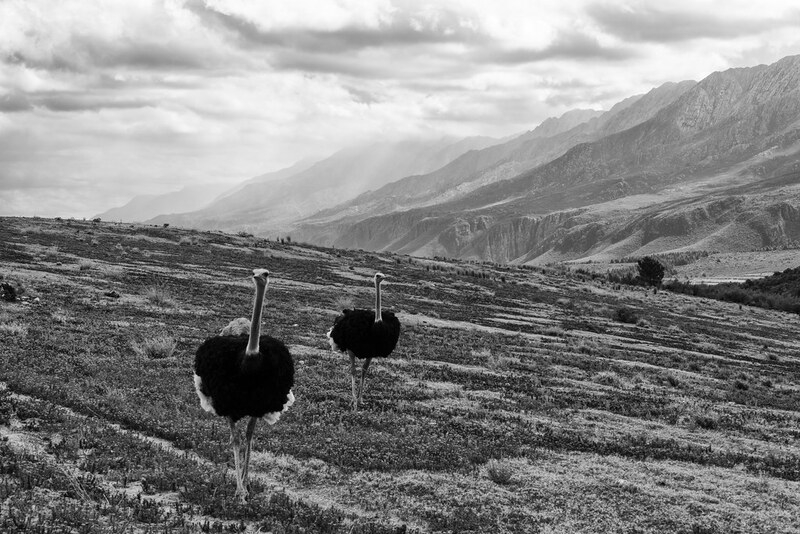 A couple of very curious ostriches. All the ones I had encountered until now ran for their dear lives as soon as I approached, but those two came right up to me! 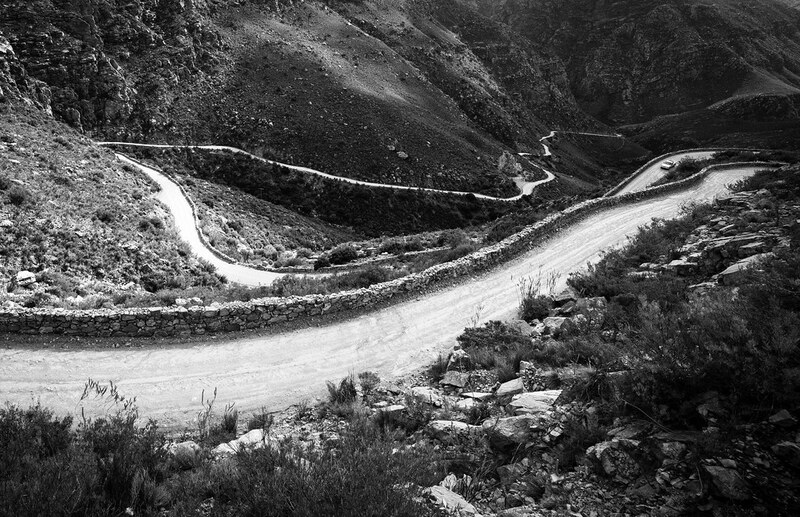 The rest of the road to Calitzdorp tested my limits that afternoon. It wasn’t, as I had previously believed, just a long and continuous downhill but a succession of short and very steep hills. 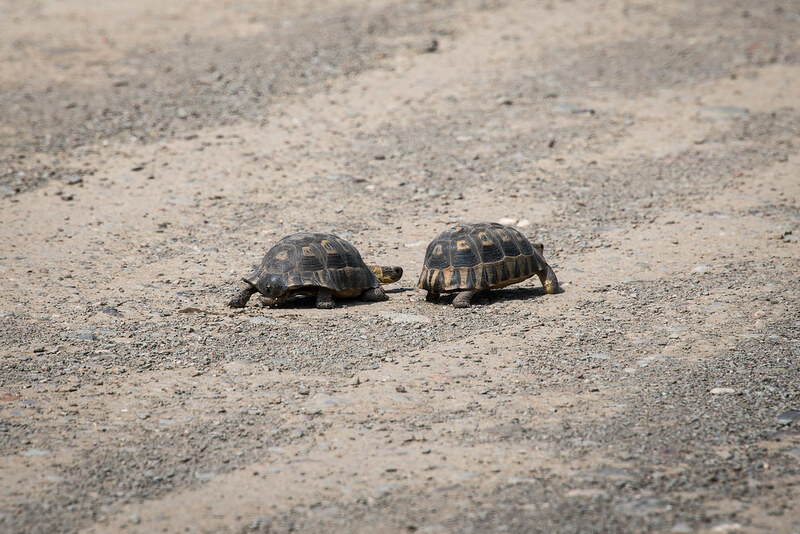 And that, if you ask me, is far worse than a long uphill! 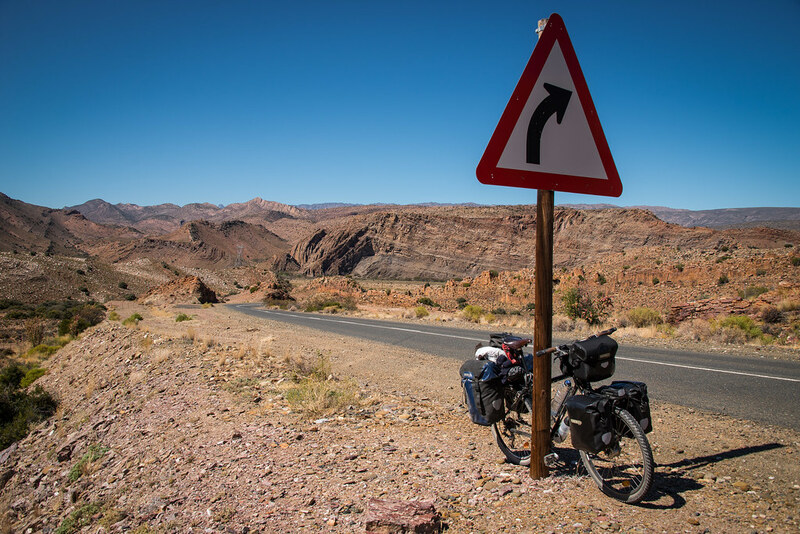 By the time I arrived at the campsite in Calitzdorp that evening I was exhausted and my legs felt like jelly. The campsite was situated in the old train station and since I was the only guest, the lady running the place let me stay in the old ticket office for the same price as camping. 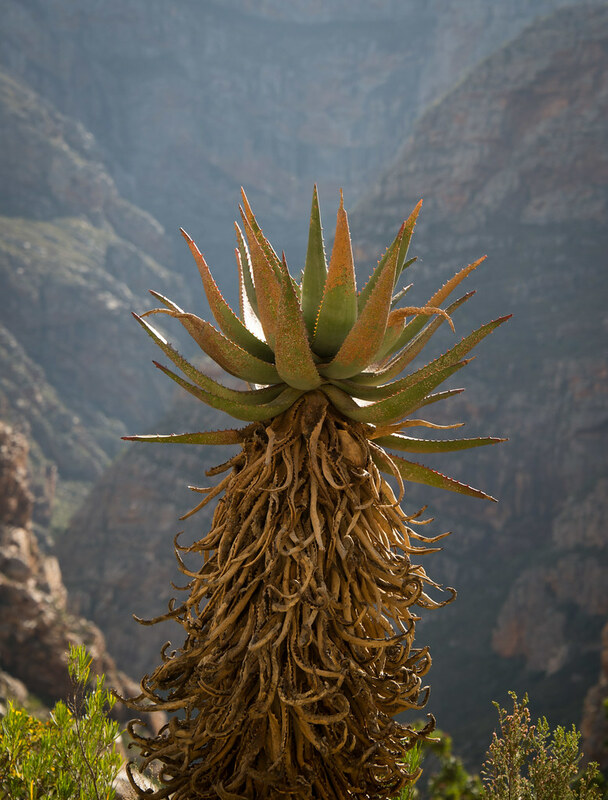 The Aloe Ferox plant, also known as Cape Aloe, is an indigenous species to South Africa and Lesotho. They looked like giants squids with funny wigs. 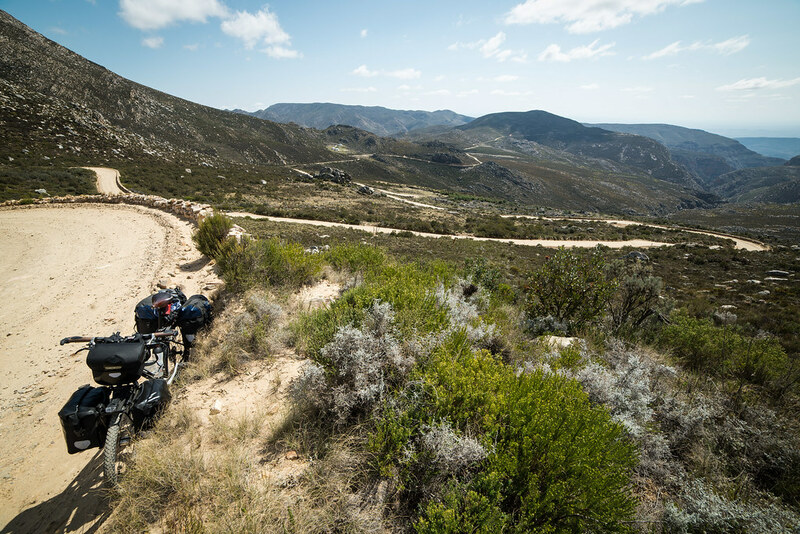 Crossing the Swartberg Moutains (for the third and last time) through the rugged Seweweekspoort Pass. The spectacular night sky was something I had read about and had been impatient to see (and photograph). 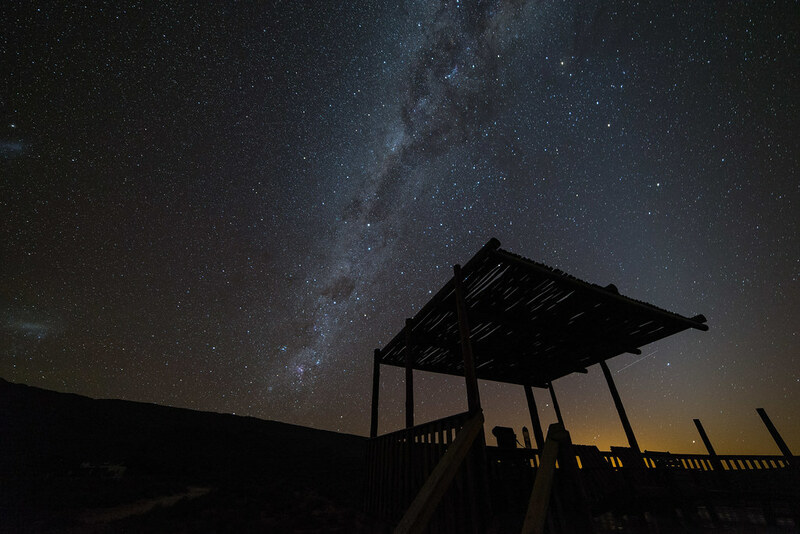 The Karoo is blessed with very little light pollution and the view certainly didn’t disappoint me. 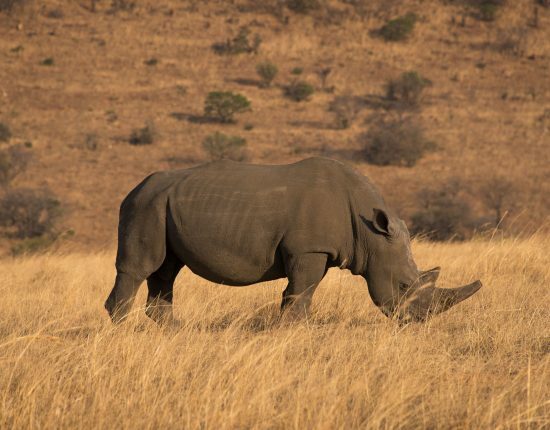 Before the turn-off to Anysberg Nature Reserve, the scenery around me changed completely. Plants and bushes became scarce and the surrounding mountains turned to a much darker red. I bet Total Recall was filmed here. I arrived in Vrede in the middle of the secluded Anysberg Nature Reserve late in the afternoon, after a rough 20 km ride along a terrible dirt track. I found the camp site completely empty, not a soul in sight, not even a ranger. Once again I was going to be the only guest that night. 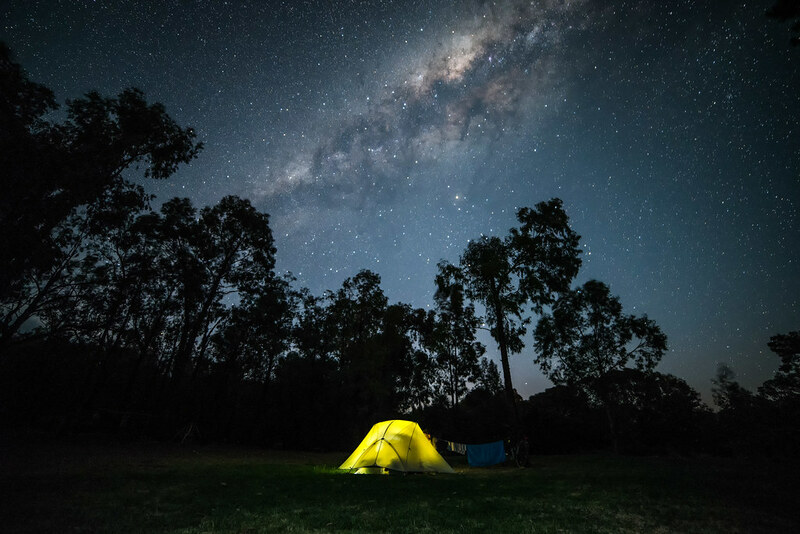 I set up my tent, went for a swim in the reservoir, cooked dinner and once night had fallen found a comfortable armchair on the reservoir deck and gazed at the truly amazing night sky for almost 2 hours. I hadn’t experienced such an overwhelming silence since our nights of wild camping in the most remote parts of Central Asia. Not a bad place for a swim! 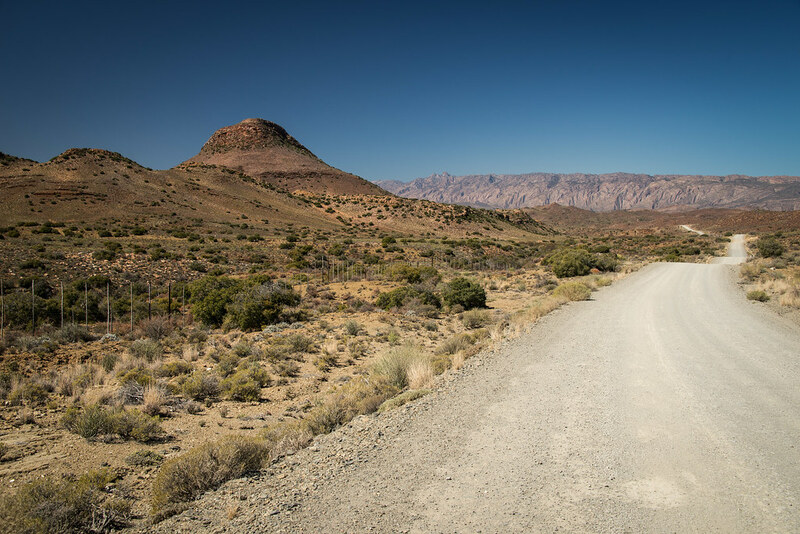 Quiet roads and stunning scenery on my way to Montagu. 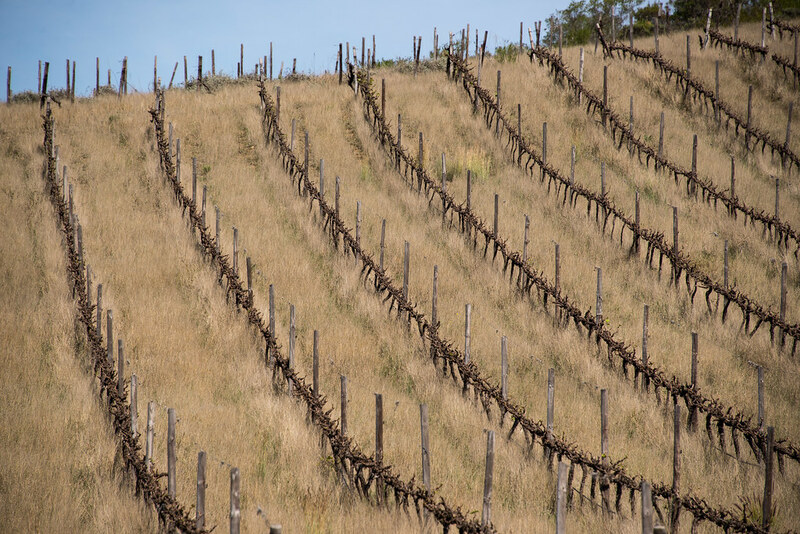 Vineyards between Montagu and Swellendam. 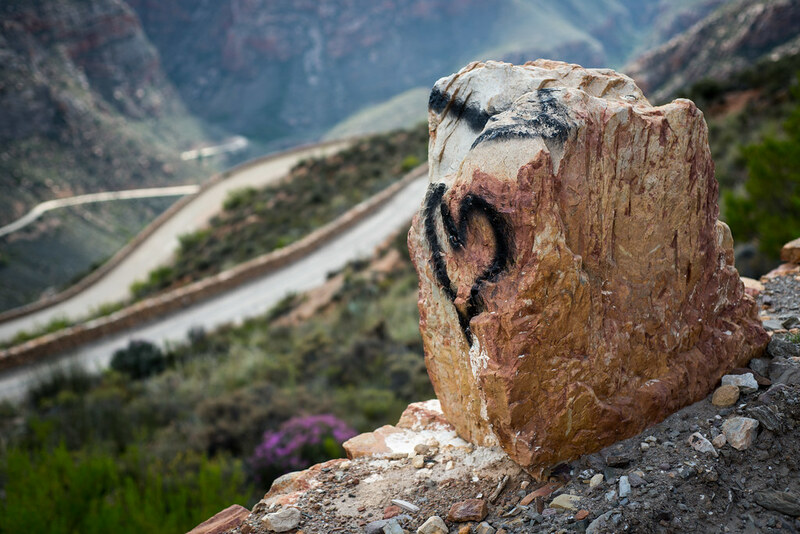 Great photos… I miss SA!